Two of our editors, John Patrick Pazdziora and Defne Çizakça, are being interviewed by the remarkable Kate Wolford at Enchanted Conversation. They’re talking about a new fairy tale anthology that a lot of Unsettling Wonder editors took part in, as did Professor Wolford herself. The book launch for the anthology was yesterday, so we asked Ms Çizakça to write a bit about the anthology, and why it’s an important development in the study of—and delight in—fairy tales. You can read her post below, and then head over to Enchanted Conversation to read further the interview with her and Dr Pazdziora. We are happy to announce the publication of New Fairy Tales: Essays and Stories to all our readers here at Unsettling Wonder. 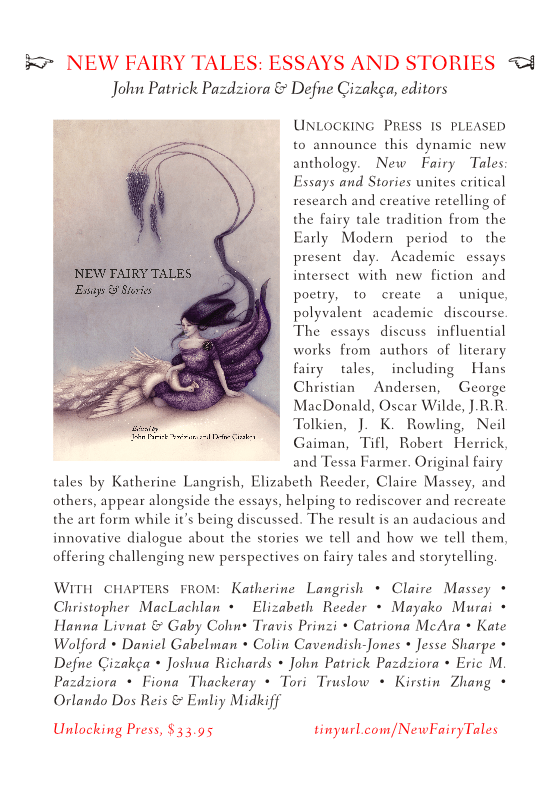 New Fairy Tales is a book on fairy tales, and a book of fairy tales; academic research and creative writing are intermingled throughout the volume. Four out of our five editors in Unsettling Wonder have been involved in the production of New Fairy Tales. John Patrick Pazdziora has scrutinized storytellers and fools, Defne Cizakca has analysed the Ottoman fairy tale, Katherine Langrish has contributed with her story ‘Gnomes’, and Josh Richards has penned the poems ‘Galantha’ and ‘Dante’, as well as a study of Kenjir­o Hata for the book. It will not be wrong to say readers who enjoy Unsettling Wonder will find a sister product in New Fairy Tales, one that delves into the depths of the genre and investigates it academically as well. 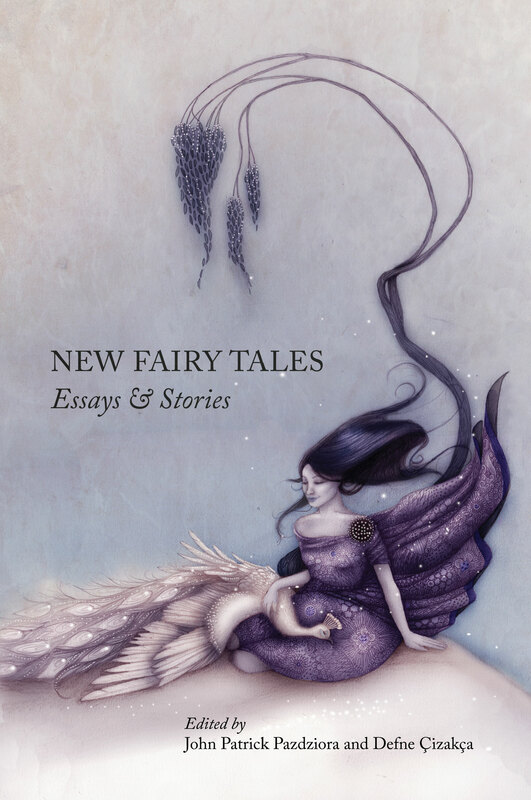 New Fairy Tales is divided into five thematic sections – Miniatures, Storytellers, Shadows and Reflections, Fairy Brides, and Fairy Tale Pedagogy – all of which contain stories as well as essays on their respective themes. While both fairy stories and academic work on fairy tales have a long tradition, no title to date had combined these two streaks under one heading. In this sense New Fairy Tales offers a unique contribution to the field. Through the process essays featured in the book New Fairy Tales presents an opportunity to think academically about creative writing as well. We hope unveiling the inner workings of authors will inspire the reader to explore their own creativity. Reading fairy tales can lead us to write better fairy tales and the work featured in the collection has potential to inspire as it steers clear from the more classic features of the genre. New Fairy Tales also explores the field in a multicultural fashion. Hence the reader will find Japanese, Brazilian and American fairy tales side by side with academic work from Israel, Turkey, and Scotland. All in all we believe New Fairy Tales will give joy to anyone interested in interdisciplinary fairy tale scholarship and creative writing from distant lands. In theory, there is nothing that stops one from putting an academic-creative-multicultural synthesis on fairy tales out into the world, but in reality such open minded publishers are often hard to find. This is why we owe a big thank you to John and Mary Granger of Unlocking Press for making New Fairy Tales possible, running with our wild idea, and supporting us all the way through this exciting process. The interview did it, overcame my last reserve (small as it was) … I’ve ordered the book. Can’t wait to dig in.